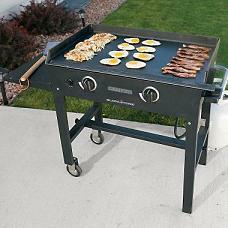 Product: The 1180 Blackstone 28" Portable Commercial Griddle is perfect for family gatherings and backyard cookouts. This commercial grade burner is great for any type of cookouts. From large breakfasts from hamburgers to steak this cast iron surface is great for evenly distributed heat and fast cooking. It gets the job done and quickly. No need to worry about cleaning off burners. With this smooth surface and a drip tray you will not need to worry about scrubbing off a grill either. Igniter uses 1 AA battery (batteries not included). Thick rolled steel surface makes for excellent heat retention and even cooking. 2" high side and back splash - keep the food on the griddle. The griddle top is about 34 inches tall off the ground. **Note - Propane Tank not included with purchase. This is designed for outdoor use only. Competitive Edge Products, Inc. is an authorized distributor of Blackstone Commercial Griddle and Grill Box. Check out our other camping equipment and picnic tables. *1 Year manufacturer warranty which covers parts replacement. Arrived as predicted. Thanks very much. It has really been a pleasure dealing with you and I will highly recommend your business to all inquirers. Received 3 griddles for Christmas gifts and am excited to give to children. We have an outdoor griddle and these are far superior to the one we have. The tops are great and the product is well designed. Looking forward to giving to children. Now I wish we had one just like it. Dimensions: 33" x 20" x 9"